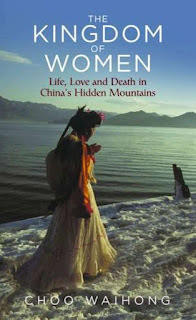 Choo Waihong has just brought out The Kingdom of Women: Life, Love and Death in China’s Hidden Mountains, an account of the Mosuo tribe, who worship the female spirit, and are the last surviving matrilineal and matriarchal society in the world. The book raises questions about gender roles in modern, urbanised society, and provides a glimpse into a hidden way of life teetering on the edge of extinction in today’s China. A Singaporean, Choo Waihong was a corporate lawyer with top law firms in Singapore and California. She dealt in fund management law, not women’s rights, but, separately, she was involved with AWARE, a women’s rights group in Singapore; she acted as its vice-president for two terms. In 2006, she took early retirement, and left behind the fifteen hour days of corporate life to travel in China. From the moment she stepped into the Kingdom of Women, Waihong was captivated. She became the first outsider to move into the heart of the tribe, where she stayed for six years. She now spends half the year with them in Lugu Lake, Yunnan. The rest of the time she continues to live in Singapore, while also travelling to Europe and America to spend time with her family. What do you hope to do with your book? I hope to tell the incredible story of the woman-centric world of the Mosuo and to record a fast-disappearing but precious piece of human history. When did you first become interested in the Mosuos? After my retirement, when I first visited Lugu Lake to witness the Mosuos’ Mountain Goddess Festival. Back then, I was just another of the many tourists who visited Lugu Lake, which had already achieved fame as a tourist destination – it is known in Chinese tourist literature as The Kingdom of Women (nu ren guo), or The Kingdom of Daughters (nu er guo). The first Mosuos I met treated me as a tourist, but over time as I visited them repeatedly, I morphed into a friend and a fixture in the community. How do the Mosuos challenge ideas about gender roles in modern, urbanised society? The customs and practices of the Mosuo tribe, being matrilineal and matriarchal, are generally antithetical to the mainly patriarchy-based culture in the modern urbanised society we know. We should be challenged by the Mosuo model to question our own social and cultural premises and assumptions. Take the acknowledged pivotal role of women in Mosuo society. In their women-centric universe, the Mosuo hold women at the top of the pyramid and everyone, women, men and children, live peaceably within that social environment. They show that this kind of matrilineal and matriarchal human society is possible and that patriarchy is not the only evolutionary model. Another challenge the Mosuo pose is the fashioning of a society without the nuclear family based on patrilineal lines. Within the tribe, the basic family structure is based on a female bloodline with no requirement for marriage between the male and female progenitors of off-spring. Children born to Mosuo women belong to, and are well looked after in, their mothers’ household under the umbrella of a matrilineal family headed by the grandmother. It has proven to be a viable alternative model to the man-woman-offspring nuclear family model. How does a woman’s life amongst the Mosuos compare to women’s lives in modern cities? There is a world of difference between the life of a Mosuo woman by Lugu Lake and the life lived by a woman in New York or Beijing. From the moment that a Mosuo baby girl is born, she is celebrated as a new and vital addition to her matrilineal family. Her birth is a precious link that ensures the family’s female bloodline continues. It is akin to the patriarchal preference for a boy to be born within the family so that the male line continues, except that in the Mosuo case, it is the reverse, with the birth of a female taking precedence. Unlike in New York City or Beijing, where all children born to a nuclear family take their father’s surname, underlining the principle of following the male bloodline, Mosuo children, both female and male, take the maternal home name of their grandmother as their surname. As a girl, the Mosuo female child is treated as a valued member of her family and she grows up in a home environment that elevates her female siblings and cousins, mother and aunts to a position above her brothers and male cousins, uncles and granduncles. Everyone in the matrilineal home looks up to the grandmother who is the head of the household. If an adult woman is capable and smart, she knows she may one day inherit the position of the head of her matrilineal household when her mother feels like taking a backseat in managing the family farm. This would never happen in a patriarchal Chinese Han household in Beijing, nor in a traditional aristocratic family in patriarchal England. In Mosuo society, each woman is accorded high status outside her home. She is respected and her opinions carry weight. This encourages self-confidence in a woman. It is quite unlike the situation even in present-day New York City where women have to fight every step of the way to gain a voice within the male-centric family and society at large. The situation is even worse for women in the ultra-patriarchal societies of Beijing and Singapore. Are Mosuo women worse off than women in modern cities when it comes to access to healthcare, and reproductive rights? Mosuo women do not have ready access to good medical benefits when compared to women in modern cities, not because they are Mosuo but because they live in a remote part of the country which is still catching up with social development. China is a large country, and although the Eastern part of the nation has made great leaps in social development, its vast rural hinterland lags behind. Lugu Lake, where the Mosuo live, is much less developed than even most other farming areas in China. This influences availability of medical facilities. Hospitals are rudimentary and only recently available. There is a small hospital in the main Mosuo town of Yongning, with a larger hospital located in the bigger county town 120 kilometres away. Today, a Mosuo woman about to give birth would generally be taken at the first instance to the smaller hospital in Yongning. Those with some means would be driven to the larger country hospital, while those in the more remote hamlets would have to make do with local midwives in their homes. Like all women in China, whether in the cities or countryside, younger Mosuo woman would be on one kind of contraception or another as the national family planning policy has reached all corners of the vast country. A woman in a rural region or belonging to an ethnic minority group has long been allowed to have two children, as opposed to women in the cities who faced a one-child policy until very recently. The number increases to three for some selected ethnic minorities, although the Mosuo tribe does not belong to the latter category. The policy limiting birth numbers in families works on a disincentive basis, with a cash penalty being imposed on any birth exceeding the prescribed number. The subtitle mentions love, life and death. What is the most enduring life lesson you’ve learned from the Mosuos? I’ve learned how easy it is for women to be confident and reach their potential when they are freed from being put down by their family, people in their community, and society in general. Unlike most other communities where women face discrimination and oppression in different and varying degrees due to the pre-dominant patriarchal paradigm, Mosuo society enjoys a distinctly different and opposing environment where womanhood is respected and revered. For that reason, Mosuo women living as women in a woman’s world are different from you or I, who invariably bears some scar or another from being a woman living in a man’s world. What’s the most enduring lesson you’ve learned from the matrilineal and matriarchal Mosuos about love? I’ve learned about the nature of it, of love, if by ‘love’ we mean love between a woman and a man. Because the Mosuo bring to the definition of love such a refreshingly different approach, it clears the cobwebs of convoluted common-place notions of the one-and-only true love in one’s life, the need for sexual exclusivity in love, the idea of a man possessing the body of a woman as if she were a chattel, the unproven nature of male polygamous love as opposed to female monogamous love, and the need for permanent pairing in a marriage between a woman and a man in the social evolution of humankind. What’s the most enduring lesson you’ve learned about death? I’ve been struck by the way the way the Mosuos grieve over the departed - a long, deep grieving which ends abruptly upon cremation. In their religious mix of ancient shamanistic practices and Tibetan Buddhist beliefs, they take to heart that dying comes with the promise of rebirth. From the moment a relative dies, the Mosuo grieves, and grieves loudly and exaggeratedly, throughout the often-protracted mourning period, of days, weeks or even months. The cries of grief and regret are loudest and most animated when the mourners accompany the cortege to the cremation site on a mountainside. But when the final act of lighting the funeral pyre takes place, the grieving stops instantly. The moment the fire catches in the pyre is the moment the Mosuo believe the deceased’s soul has departed, to the mythical place of origin of their tribe. That soul would be on its way for a rebirth. There is no more need to grieve anymore as the departed soul is on its way to a new beginning. No more crying, no more mournful faces. The mourners immediately leave the funeral site to troop back to the home of the deceased for one last meal, chatting and bantering, signifying that life has already returned to normal. Can your Mosuo friends read your book in English? No. I am afraid none of my Mosuo friends will be able to read my book just yet, although I am sure those among them whose photos appear will be thrilled to see themselves in print. I am looking to have the book translated into Chinese. Will the book draw too much attention to the Mosuo internationally? What about within China, if there is a Chinese edition? The book must draw some international attention to the existence of this matrilineal and matriarchal people, but the Mosuo tribe is already well known in China for being an interesting tribe with its intriguing social practices and Lugu Lake enjoys a reputation as a much sought-after tourist destination. I really don’t think a Chinese edition of my book would risk exposing the Mosuo way of life to the greater Chinese market. There are already more than a dozen books on the Mosuo written by Chinese anthropologists, sociologists, scholars and journalists as well as a host of television documentaries and snippets about the tribe and its unique lifestyle. Tens of thousands of tourists throng the lakeside Mosuo hamlets every year, with many more being predicted after a new airport recently opened. How will the Mosuo survive in modern China? The prognosis is not good. The old way of life among the Mosuo began disappearing when their homeland opened up to tourism at the start of the twenty-first century. Much of the tribe’s traditional culture is no longer practiced amongst the younger Mosuo living by Lugu Lake where tourism is concentrated, although there are still traditional remnants to be found further inland in the more remote villages. These issues are explored in the last chapter of my book, On the Knife-Edge of Extinction. Details: The Kingdom of Women in published in hardback by I.B. Tauris, priced in local currencies.